Mr. Dombalis graduated from Hampden-Sydney College in 1972 with a BA in history. He received his law degree from Wake Forest University in 1975. Mr. Dombalis has a wealth of trial experience, as he has tried many civil and criminal cases over the past 40 years. Following his graduation from law school, he worked as an assistant district attorney in Wake County from 1975 until 1979. During the last years of his tenure as an assistant district attorney, he was a member of and then the head of the Career Criminal Prosecution Unit. 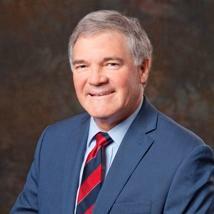 Mr. Dombalis entered private practice with this firm in 1980. His practice focuses on family law but he continues to represent those charged with traffic and misdemeanor offenses and those who have been injured by the negligence of another. Mr. Dombalis has been active in civic and community affairs. He served as Chairman of the Board of the Eastern North Carolina Chapter of the National Multiple Sclerosis Society, member of the Board of Directors of Interact, and President of the governing board of his church. Mr. Dombalis was awarded the Distinguished Service Award by the Raleigh Jaycees for his service to the community. Mr. Dombalis is a member of the North Carolina Bar Association, and has served three terms as a member of the Board of Directors of the Wake County Bar Association. For many years he mediated and arbitrated fee disputes for the Wake County Bar Association Fee Dispute Resolution Committee. Mr. Dombalis is AV rated by his peers in Lexis Nexis Martindale Hubbell. This is the highest rating given for legal ability and ethical standards.